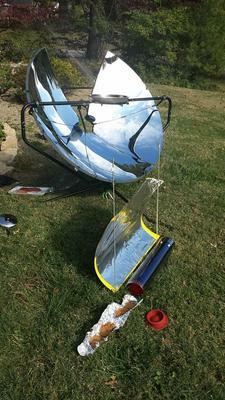 SolSource parabolic and my little evacuated tube cooker. 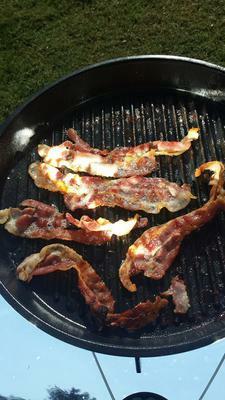 Well, after a few attempts, Bacon made its debut on the solar cooker! After a lackluster performance on the camping trip, I brought the cooker out at the end of my fall break in an open hilly area at my parents' house with an unobstructed view of the sun. I continue to experiment with a cheapo evacuated solar tube, which drew less attention. Until I get it where I want it, I just make cookies. Forgive the pun but in full sunlight, this SolSource really shines. It powered through the 1lb of bacon and sizzled just like it would on a stove top. 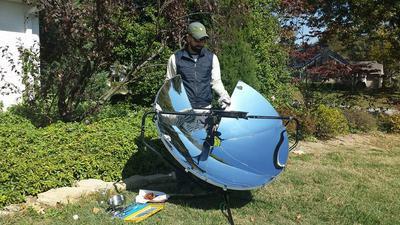 I took a few video clips and sent them to my friends from the camping trip for a touch of solar cooking redemption. I have often wondered why SolSource never capitalized on the expansion slots that they have built all along the circumference of the dish. I've seen concept pictures online where you could possibly add more panels to increase the heat. As I cooked bacon though, I found that the top portions of the panels reflected enough sun energy on the top of the pan to burn the food if left out too long. Maybe too much food was being burned during beta testing? I would say that the main thing I have learned over this fall break is the temperamental nature of cooking with a parabolic cooker. I would imagine that solar ovens or evacuated tubes are much more resilient in cloudy situations due to their insulation. When clouds are present, cooking with a parabolic oven can be a risky endeavor. Clouds will essentially turn the oven "On" or "Off" -- and the duration of being "off" is completely up to the speed of the cloud. The pan WILL hold quite a bit of heat, and once the cloud moves, cooking can resume, but there is an audible sizzle difference when clouds come out to play. For the outdoor crowd: When the sun shines, so does the SolSource. When there are clouds, it is good to have a backup.